Iain Henderson is understood to have produced another remarkable recovery from a hand injury and is expected to be named in Ulster’s team later on Thursday to face Ospreys in Friday night’s Guinness PRO14 fixture in Bridgend. It will be a huge boost not only for Ulster but Ireland head coach Joe Schmidt as they prepare to face Italy in Rome in just over a week’s time. Henderson has become known as the quick healer, particularly after defying the odds in January to return several weeks early following a thumb operation. The 26-year-old played for Ulster in their crunch European Champions Cup pool match against Leicester Tigers and produced a man of the match display in the 14-13 win, a victory which secured the Province’s place in next month’s quarter-finals for the first time in five seasons - they will meet Leinster at the Aviva Stadium, Dublin on March 30. However, it was in that game that he suffered a finger injury - unrelated to the thumb injury - which ruled him out of Ireland’s opening two games in the Guinness Six Nations Championship. It appears the injury may not have been as bad as feared at the time and having already returned to training with Ulster - although limited in contact - the British Lion is ready to go again. With Ulster pressing hard to make the play-offs in the PRO14 and with it automatic qualification for next season’s European Champions Cup, their next three fixtures against Ospreys (away), Zebre (home) and Dragons (away) are crucial as they attempt to recapture second place in Conference B. There are only two points separating four teams - Benetton, Edinburgh, Scarlets and Ulster - who are bidding to finish in second and third behind runaway leaders Leinster and secure play-off spots. 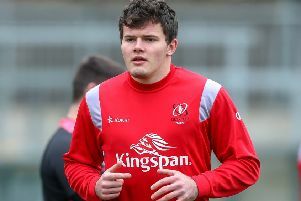 Ireland scrumhalf John Cooney has been released from the National camp which is another boost for Ulster, and along with Henderson, Jordi Murphy is also expected to start in the pack. Ulster and Ospreys will confirm their line-ups around lunchtime on Thursday. Ireland have a down week in the Six Nations programme before going to Rome to meet Italy on Sunday, February 24. Schmidt’s Ireland had already lost to England, but got their championship defence back on track with a win against Scotland on Saturday. Given the injury profile Ireland currently have, a fit again Henderson would be a massive lift for the side.